I recently received the very sad news that my long time friend and fellow band mate Chris Black had suddenly passed away after suffering from heart- related ailments on January 26th, 2016. He was 77. I first met Chris way back in the mid-1970's when he and his band 'Black Cat' were playing the Rock 'n' Roll pubs and clubs around Britain where we often used to bump into each other. 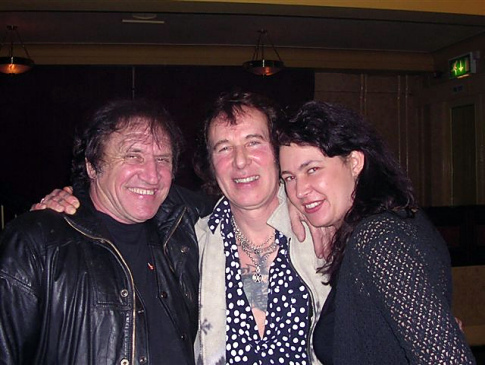 We became good friends and subsequently played many gigs together thereafter, including countless shows with the late great Screaming Lord Sutch who was a great friend of ours together with Tommy Bruce, Heinz, Billie Davis, Brian Poole, Terry Dene to name a few,... They were wonderful days that can never be repeated and they will stay with me forever. Chris was a real character and was from the old School of Rock 'n' Roll that I admired very much, and if it wasn't for him with his constant determination to promote all that he believed in, many of the tours that we played back then might never have happened 'cause he lived and breathed Rock 'n' Roll, and always followed where his heart led him, because if he'd followed his head, he'd probably never have given up his day job. He loved what he did and I can't imagine him being quite as passionate about anything else,... He was devoted to it! Over the years we travelled from London to Cornwall, Brighton to Scotland, Holland to the Czech Republic and Germany to Finland playing Rock 'n' Roll music wherever anyone has wanted to hear it, seeing some beautiful parts of England and across Europe that we might never otherwise have visited, and meeting some wonderful people whose lives might never otherwise have touched ours. So I would like to take this opportunity on behalf of Chris, myself and all the band members from 'Black Cat' (past & present) and of course the sensational "C'mon Everybody" touring show' that Chris was so proud of,... To say thank you to you all out there who've accompanied us on our amazing memorable journey that has now sadly come to an end for Chris,... Cherished Memories Indeed. I don't think you will ever see the likes of Rock 'n' Roll performers like Chris again, and that's a great shame, he was a one off from an era that has long disappeared with all the other greats of his time. The Rock 'n' Roll world hasn't only lost another great guitarist,... It has also lost a good friend to so many Rockers that followed him throughout the years. So fairwell ol' buddy, I shall always remember those great times we had together, and I will miss you dearly alongside your Family, Friends and many Fans! Always a friend, and a Rock 'N' Roll brother to us all.